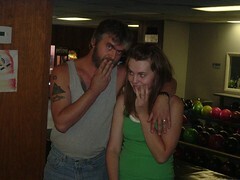 Kelsi and I posing for a picture for Grandma Bieber. Jonna and I took our first “away” vacation in about three years this week. It was also the first away vacation without the kids. We decided to head out to Las Vegas since she had never been there and I had never been there with her. We had also decided that while we would take our two digital cameras, we would go without any laptops so that we could ensure no distractions from each other. We would fill the cameras with as many pictures as would fit and upload them when we got home. This trip was also the first time that I had flown US Airways. Big mistake in my opinion. We left at about 10a for a 4:00 flight, so that we could make sure to get into long term parking, through baggage check and security and to the gate in time to be at the plane about 2 hours early. Security, I have to say, was much less hassle without a laptop around. Once we had checked our luggage all we really had was our camera bags and we got through security pretty quickly. We sat at the designated gate for about 3 hours. About 1/2 hour before boarding, Jonna noticed that “Las Vegas” was not posted at the gate and we quickly realized that they had changed the gate on us – no announcement, no nothing. Next was a mad scramble to find the flight boards so we could figure out exactly which gate we were supposed to be at. Apparently there were quite a few people who ran into this problem (mostly those of us who had checked in extra early) as we later found in line on the way back. By the time we actually got on the plane, we sat another hour before we actually took off. I’ll tell you a great recipe for an unpleasant trip for a non-smoking wife. Take your chain-smoking husband on a three hour flight that takes 3-4 hours in the airport and another hour sitting on the runway. I wound up being so irritable that Jonna felt compelled to pull out the camera and take a picture. It wasn’t a fun time for me but she took it all in stride (and was actually a little amused). But it did get better. We touched down in Las Vegas 3 hours and 26 minutes later and headed for the baggage claim and took the shuttle off to the Mirage, where we would be staying for the next four days. 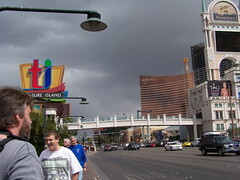 On Monday morning, we woke up extra early, strapped on the cameras and headed down towards the far end of the strip. The strip looks small until you pound the pavement for five hours or so. For someone as out of shape as I am, this is not a good idea. My legs were so cramped by the end of the first day that I had a hard time even moving without my legs tightening in pain. We got a lot of great pictures the first day, but it wouldn’t be until today, well after we got home, that I could walk without wincing. For some reason, the Venetian was something that every time I walked by I had to take a picture of it. I think it was because it looked like a huge computer tower, and I was without my laptop – but I’m not sure. All I know is that every time we walked by, I felt like I hadn’t gotten a good picture and had to take one more – just in case. Obsessive-compulsive behavior at its finest. 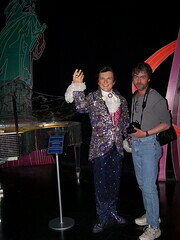 On Tuesday, we decided to hit Madame Tussauds Wax Museum. I enjoyed all of this except one part. They had some horror movie exhibit that we decided to go into, thinking that it would be wax figures of horror movie killers (you know, Jason, Freddie and the like). They made a really big deal out of the fact that no pictures could be taken in this section so we thought that we would definitely be seeing something cool. It wound up being a glorified spook house, that had really nothing in it except people popping out at you. Nothing really picture-worthy and definitely not worth the detour we took from the main attractions. I do have to say though, that once you see the movie House of Wax, this place is pretty creepy without the spook house. Perhaps it would have been more effective to just screen the movie and have you walk through afterwards. Wednesday night, we had tickets to see the Elton John – The Red Piano show at Caesars Palace. 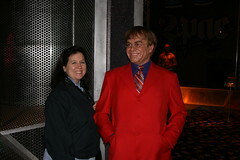 Jonna has always been a huge Elton fan, and soon after we met she renewed my interest in his music. We thought this would be a great capper to the vacation – and it was. The Caesars Palace Colosseum is the perfect venue. I could not find a bad seat in this place. We were seated way at the top of the stadium (these shows tend to sell out pretty quickly) but we had a perfect view of the stage. The Colosseum is laid out very well and Elton still puts on a great show after all of these years. The show lasted until around 9:30 or so and Jonna and I quickly headed back to the hotel, completely exhausted and ready to go to sleep. One thing I really enjoyed was the orderliness of the crowd. This wasn’t like going to a Metallica concert where everyone is yelling and screaming on the way in. The atmosphere was very, um, “grown up”. People walked single file, didn’t push, and sat down and were polite through the whole show. I can’t remember a show where I was as pleased with the environment. Elton was certainly at the top of his game and the stage show itself was – well – interesting. Jonna and I are not big gamblers. Jonna threw $5 into the nickel slots the first night and doubled it in 15 minutes. Then she gave half of it and I lost it in what seemed like under a minute. We did spend some time playing $.50 BlackJack at the bar. I turned $1 into $9 in about 15 minutes and then lost all of it in about 5. Thinking I could repeat, I threw another $5 in – which was also lost in a little under 5 minutes. If they paid out for how quickly you could turn cash into nothing, I would be rich right now. There are quite a few changes to Vegas since I was there last. The most obvious was the smoking legislation enacted in November/December of last year. There are quite a few restrictions related to smoking in Vegas these days, which seemed kind of odd to me. While I am a smoker, I do not necessarily disagree with the legislation the way it is written, it just seemed odd given Vegas’s “anything goes” reputation. We’ve got a lot of these bans going on in Illinois right now, disallowing smoking within 40 feet of an entrance to a public building. Bars in neighboring counties are completely non-smoking and smokers need to head out to the parking lot (not just outside the door) to indulge in their habit. I’m ok with that. However, I definitely think twice about traveling these days, as four hours in an airport for me is torture. It would be nice if there could be some way that we could go somewhere to smoke while we are sitting in the airport. I was shocked to find all of the smoking sections in the Las Vegas airport removed due to the new legislation. While the smoking sections they had last time I was there were not pleasant (I would only go in there if I really had to and would get out as soon as possible), at least they were there. They say that Las Vegas is the city that never sleeps. I have to tell you, as we get older, we wound up doing a lot of sleeping. We were up past 10 one night out of the 4 we were there. The rest of the time, our old bones were exhausted and we couldn’t wait to get back to the room by 9:00 or so. We would fall asleep in about a half hour and roll out of bed at 8 or so if we were lucky, 10 worst case. You really have to get away from “real life” periodically. I can’t tell you how nice it was to not have the computer as a distraction for four days. It gave me the ability to really enjoy time with Jonna, without thoughts of work or other things that I always feel I “need to do” when we are at home on vacation. I am in really bad shape. There should be no reason that five hours of walking should have trashed me so bad on the first day. Jonna and I need to take walks every now and again to offset all of the time I spend at my desk. Walking around from meeting to meeting just doesn’t cut it anymore. Jonna and I had a brief conversation during the trip about my inability to separate work and home life. It seems that if I’m home, I’m unable to recognize that I don’t have to work on something, whether it be my day job, or things that I want to work on outside of it. I need to get some balance in my life. I was amazed at how relaxed I was being away from home with no access to email. I really need to figure out how to create this separation, because the way I am going just isn’t healthy. While I’m still not very good at it, I really enjoy digital photography. I should be spending my time learning about it more than I do. Upgrading the Kids Memory – It winds up that the machine they have, an HP Pavilion 700 series, is maxed out at the current 512M. Bummer. Recovery Disks for Windows XP machine – I got all of my data centralized into one place on the Windows machine – ready to burn to DVD – when I realized that I don’t have a DVD writer on the laptop. Once I realized I’d have to burn 4-5 CD’s worth of stuff, I abandoned the idea of rebuilding the machine for the evening. Since the weather is so beautiful today (hey, at least its not snow), perhaps I’ll do it later in the day. I’m currently copying everything up to the Linux box, which can then be migrated to the Mac, and a DVD burned with all the data. All in all, yesterday was pretty productive. I was a tad disappointed that the Pavilion wouldn’t take any more memory, but overall I got a lot of things done that have been waiting for quite some time in the queue. I also got an unexpected treat. 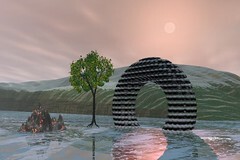 Back in August I had thrown a link in my del.ici.ous links about Bryce, a 3D rendering program, being released for free for a limited time. I had downloaded it back then but had never done anything with it. I used to love this program back in the day and would spend hours playing with it. I’m not really the artistic type, as I tend to get extremely frustrated when I try to do anything even remotely resembling “art”, but I loved that program. Last night I was able to expose Jake to it, which was pretty cool. He loved it and spent some time playing around with it starting with a base landscape that I threw together just to show him what it could do. I found it extremely cool to share something like this with him from back in the day that he was actually interested in seeing. For me, it was cool to play around with an old friend again and to share it with one of the kids and actually have them find it interesting. Those moments come few and far between as the kids get older. I’ll end this with the final rendering of what Jake was working on last night, while I go check my file copies from the Windows box.